Other Info: There is a small box on the invoice that says how they reuse cardboard packaging for their shipments in order to better preserve the environment. They also request that their customers pack out garbage from their packaging and recycle. The bags that the meals are packaged in are very small and look as though they will be very easy to pack. Each bag is separately labeled with the flavor (i.e. Beans with Nacho Cheese), the 3 step process for mixing it with water, and an ingredients list. There also is a sell-by date on a different sticker on the back. 1)	Put dry mix in bowl and mix well. 2)	Add � cup cold water. Stir. The food is basically refried beans, but without the moisture in the beginning. I went ahead and ate one of the packages. I started out with "Beans with Nacho Cheese." It seemed as though the 2-3 minutes was not long enough to allow for saturation of all parts of the mix. As a result, there were some crunchy bits and in general it was a little gritty. As the mixture sat for longer though, it became more like refried beans, at room temperature. The taste was not special. It did smell kind of funny and it did not look at all appetizing before I put it in a tortilla. Also, the mixing bowl was pretty messy after I was done. I will likely try cleaning it with a tortilla next time. Next week I will be spending some time on the Appalachian Trail in Virginia. I plan to eat two lunches of this food while hiking. Besides that, I plan to take a few packets with me for some of my longer field work days (hiking in streams doing research) since they don't require cooking. Otherwise, I will eat the rest on either hiking day trips or overnight backpacking trips. -	Is cleaning up after this meal going to be too much of a hassle? -	Is measuring the � cup (177.4 mL) of water going to be an issue while backpacking? How exact does that number need to be? -	How will my digestive tract handle refried beans on the trail? The food seems like its going to be good stuff for when I am hungry. It definitely is "thick" food, not just something to snack on. This concludes my Initial Report. Please come back in two months to see my Field Report. I have eaten these meals while backpacking, day-hiking, doing field work in local streams, and a couple were sampled in-house. Initially, they all tasted the same to me. The ones with Taco Flavored bits are slightly more distinguishable due to the hint of other taco ingredients. The packets with Salsa Spices have a little more flavorful aftertaste, but mostly they all taste like re-fried beans to me. I tasted all of them with a spoon following prep, before I spread them on tortillas or added other ingredients. After further consumption, I realized that I enjoyed the Beans w/ Taco Flavored Bits the most (due to its spice). Both of the flavors with cheese I dislike after repeated exposures. Also, they take the hardest toll on my stomach and when cold, have a weird consistency. I used the mix by itself on a tortilla, as instructed on the packages. I also used the mixes with Tortilla Chips (which work well also). As for mixing, I have eaten a couple flavors with melted cheese mixed in, which made for a good flavor. Putting cold cheese on the tortilla before spreading the mix also worked well for me and helped the beans to taste better as a meal. Finally, I tried a tortilla with the prepared mix with couscous prepared with Italian dressing. It was a really good, contrasting flavor and texture. Although appearance doesn't really make that much difference, it did make it hard for me to get others to try and eat these meals with me. Since they are meant for two people this sort of became an issue on my trips. I ended up eating the whole meal spaced out because nobody else wanted to share, based on looks. The preparation is as easy as it seems. Adding water and stirring is not difficult. If too little water is used, a little more can easily be added. However, if too much water is added, the mixture becomes a large mess. The mixture is already sort of a mess as it is. I use a tortilla to wipe down my mixing bowl when I am done, but getting all residual bean mix out of a dish is still difficult. Although the mix can be prepped cold, it seems strange to me at room temperature. Even prepping it with slightly warm water is a better alternative than just cold or room temperature water. Despite a good mixing and ample time (twice the recommended) to stand and absorb the water, there was still the occasional crunch of un-softened bean. This also happened while eating the taco flavored bits. While it did not harm my teeth or stop me from eating anymore, it was weird to have a sort of soft gravel/sand texture during some bites. The most recent samplings I allowed to sit for over an hour to absorb water. This resulted in a very soft and smooth consistency. Each packet is designed for two people. This makes for a minor dilemma when using solo, as there will inevitably be leftovers (I tried to eat a whole package and it just made my stomach hurt). If the mix is prepped in a bowl, then somehow the re-hydrated beans have to be disposed of or stored as garbage in a way that will not later squish out into a pack. The solution I have come up with is a small Tupperware piece, to prep, dispense, and store mixture for eating. This also sort of eliminates the need to try and clean something this messy in the backcountry. Nutritionally, this is good stuff for eating when caloric use is high. I felt full after eating this and ready to keep hiking. Comparing the weight of each little packet with how much eating it provided, I would rate this as an excellent choice for people looking to reduce pack weight by food choices. Bringing the packets with me in my food sack was very easy. I added another Zip-Lock just in case. Packing out the empty small bags was equally easy and I was glad to have as little packaging as possible. From the perspective of my digestive system, I anticipated re-fried beans in the woods to cause more frequent bathroom breaks. I learned that adding a good amount of cheese along with this meal kept digestion in check. The mixtures and tortillas do an excellent job of satisfying my hunger. However, after eating a serving, I find that I do not want to eat anymore for some time. For me, the mixtures work well for a single meal in a multi-day trip. I don't see myself making this a repeat staple menu item on a single trip. First of all, their slogan is "camping food so good, you'll want to eat it at home!" Right off the bat, this sounds like it's too good to be true. For the most part, the food I eat on the trail isn't the same as what I eat at home. It's usually much more rich, and although I like it when I am hiking, when I am home it never tastes the same to me. If this is true, then they have done some good magic here. I hate it when I have leftovers, because I never want to eat it at home. 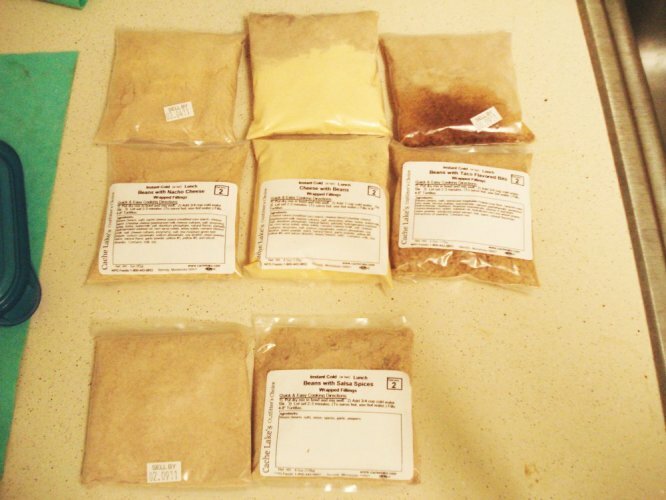 THE MIXTURES ARE CRAZY RICH, SO EVEN THOUGH IT JUST TASTES LIKE RE-FRIED BEANS, I DON'T WANT TO EAT THEM AT HOME. Does it taste rich? Does it taste excessively salty or sweet? Can I taste preservatives? Is the texture of the food weird? Weird "feeling" food is sometimes worse than bad tasting food. Does it make me think of Meals Ready to Eat (MREs)? YES, IT TASTES RICH. IT DOESN'T TASTE SALTY OR SWEET, BUT VERY NEUTRAL. I CANNOT TASTE ANY PRESERVATIVES. THE TEXTURE IS EXACTLY WHAT YOU WOULD EXPECT FROM REFRIED BEANS. IT LOOKS JUST LIKE THEM ALSO, WHICH ISNT VERY PRETTY LOOKING. THEY DO NOT TASTE LIKE MRE's AT ALL. It looks like there is basically no prep, in terms of heating. Can I heat it to make it better? Since heating is not needed, what else needs to be done? Is it obvious or does it require instructions? How easy is it to "mess" up? Can I add my own ingredients to make it better? Or am I likely to screw it up doing this? Is it worth its weight and bulk if I am already strapped for weight and volume? YES, IT IS WELL WORTH THE WEIGHT. YES, IT IS CRAZY EASY TO PREP. HEATING IT MAKES IT TASTE AND FEEL MUCH BETTER. Does this food keep me going? Do I feel good after I eat it? Does it make me sleepy if I eat a lot? THE FOOD DOES NOT MAKE ME DROWSY AND IT FILLS MY STOMACH. I FEEL FULL AFTER EATING IT. This is good food for strenuous backcountry activity. Its crazy easy to prep, extremely filling, and easy to pack in/ pack out. -	effect of beans on digestive system�in woods. Thanks to Cache Lake and to BGT for the option to test this product.